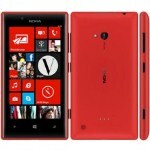 As we know, Nokia Lumia 720 is not yet officially launched in Indonesia. But one of the main Nokia distributor in Indonesia, "Sentraponsel" post the Nokia Lumia 720 in they website and reveal offiicial price. Based on Sentraponsel's website, The official price of Nokia Lumia 720 is IDR 3.499.000, but until now still "out of stock"
We don't have any information about this price & sale in Indonesia since Nokia Indonesia is not yet launched this product to the Indonesian Market. We will keep you posted when some new information available about Nokia Lumia 720 in Indonesia.